Last Sunday I was spending a pleasant hour reading in the library when I received a tap on the shoulder. I looked up to see Eleanor, apron on waist and baker’s hat on head, holding out a liquid measuring cup. “Mom, how do I measure brown sugar in this?” she asked, holding the cup out to me. I explained how she needed a dry-ingredient cup, and she left. When she returned for a third time with a question about spatulas, my curiosity got the better of me, but Eleanor refused to fill me in on what she was doing. 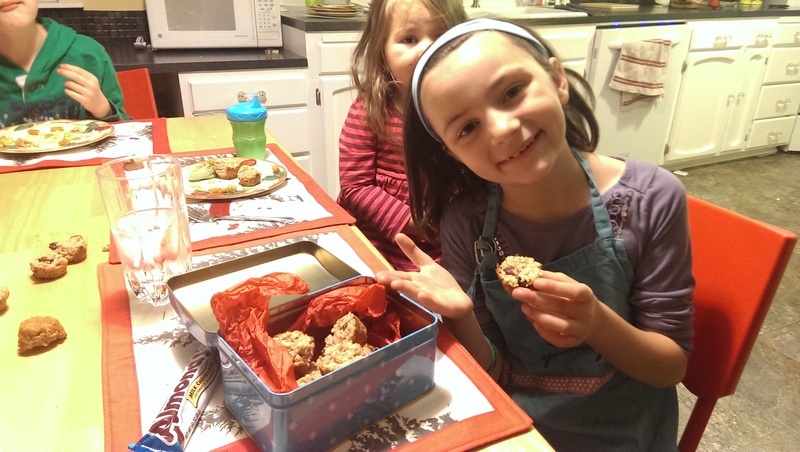 Eleanor bought the tin from the dollar store for me, and made the cranberry-oatmeal muffins all on her own, using a recipe in a children’s cookbook. I don’t know if I’ve ever gotten a more amazing present from one of my children. Love it. The muffins were tasty, too — we ate them right after dinner. Katie picked the cranberries out of six of them, and refused to eat anything else. Yummy little cook!